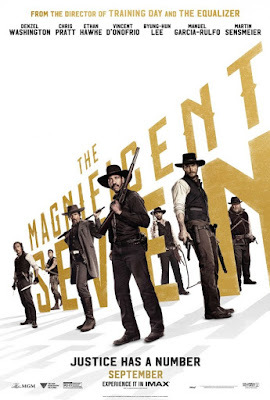 Magnificent 7, directed by Antoine Fuqua, is a remake of the 1960 film of the same name which is a remake of Akira Kurosawa's Seven Samurai film from 1954. 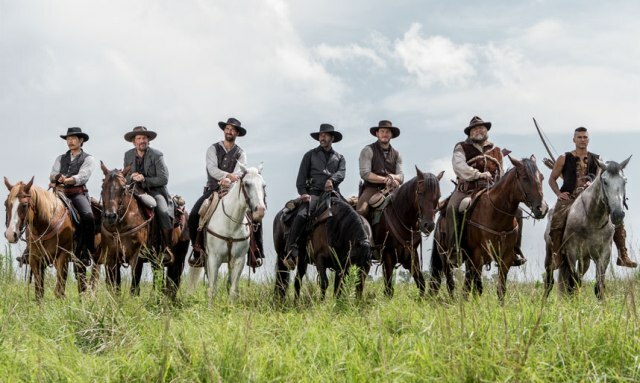 This wild west tale of underdogs fighting impossible odds features an all star cast including Denzel Washington, Chris Pratt, Ethan Hawke, Vincent D'Onofrio, Byung-hun Lee, Haley Bennett, Peter Sarsgaard, Luke Grimes, and Matt Bomer. Antoine Fuqua has built a pretty impressive resume over the years with a roster of directing credits that includes films like Training Day and Southpaw although this may be his most high profile project to date. The material is by no means original, but it does lend to telling a very entertaining story and that's what this movie is really all about. As an audience, we know what to expect and we are there to see all the big stars so all Fuqua has to do is put together a fun movie that is filled with lots of gunshots, a few jokes, and equal doses of heroism and sacrifice and that's exactly what he does. The cinematography is absolutely beautiful and filled with the type of sweeping panoramic vistas and stunning imagery that hearkens back to the classic western films of decades past. The actors in this film seemed to really have a great time and that enthusiasm comes across in their performances. The focus, of course, is on Denzel and Chris Pratt as they are easily the two biggest personalities on screen and they are given all of the appropriate material to allow them to shine. 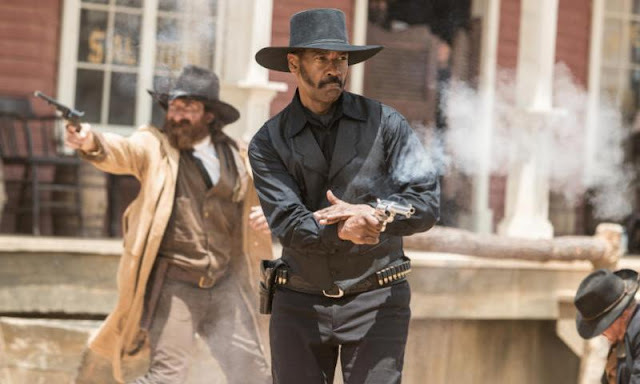 Denzel is the unwavering gunslinger who has seen more than his fair share of action over the years and Pratt's take on his fun loving sharp shooter character fits in perfectly as both comic relief and as a genuine hero among what is otherwise a rather unsavory bunch. The two actors who really dig into their roles and pull out some uniquely interesting characters are D'Onofrio, as you would expect, and Peter Sarsgaard who is the epitome of dastardly devilry and a worthy villain against the seven heroes. Magnificent 7 is a very entertaining film filled with all the classic thrills you would expect from a highfalutin western type motion picture. I thought the two hours and 12 minute run time might be a bit long, but the story never drags and you barely notice the time slipping away thanks to a very clean script and some well paced editing. Antoine Fuqua knew exactly what he wanted to do with this well worn material and the end result is a fun action movie that does not disappoint. I did not see the film in IMAX so not able to comment although I do know the film was remastered for the format and IMAX cameras were not used for any portion of the film.